Om! Having bowed down unto Narayana, and Nara the most exalted of male beings, and unto the goddess Sarasvati, must the word Jaya be uttered! Sanjaya said, "Those heroes then together proceeded towards the south. At the hour of sunset they reached a spot near the (Kuru) encampment. Letting their animals loose they became very much frightened. Reaching then a forest, they secretly entered it. They took up their quarters there at no great distance from the encampment. Cut and mangled with many keen weapons, they breathed long and hot sighs, thinking of the Pandavas. Hearing the loud noise made by the victorious Pandavas, they feared a pursuit and therefore fled towards the east. Having proceeded for sometime, their animals became tired and they themselves became thirsty. Overpowered by wrath and vindictiveness, those great bowmen could not put up with what had occurred, burning as they did with (grief at) the slaughter of the king. They however, took rest for a while." Dhritarashtra said, "The feat, O Sanjaya, that Bhima achieved seems to be incredible, since my son who was struck down possessed the strength of 10,000 elephants. In manhood's prime and possessed of an adamantine frame, he was not capable of being slain by any creature! 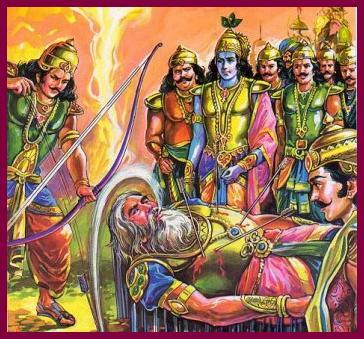 Alas, even that son of mine was struck down by the Pandavas in battle! Without doubt, O Sanjaya, my heart is made of adamant, since it breaks not into a 1,000 fragments even after hearing of the slaughter of my hundred sons! Alas, what will be the plight of myself and my spouse, an old couple destitute of children! I dare not dwell in the dominions of Pandu's son! Having been the sire of a king and a king myself, O Sanjaya, how shall I pass my days as a slave obedient to the commands of Pandu's son! Having laid my commands over the whole Earth and having stayed over the heads of all, O Sanjaya, how shall I live now as a slave in wretchedness? How shall I be able, O Sanjaya, to endure the words of Bhima who hath single-handed slain a full hundred sons of mine? The words of the high-souled Vidura have come to be realised! Alas, my son, O Sanjaya, did not listen to those words! What, however, did Kritavarma and Kripa and Drona's son do after my son Duryodhana had been unfairly stuck down?" Sanjaya said, "They had not proceeded far, O king, when they stopped, for they beheld a dense forest abounding with trees and creepers. Having rested for a little while, they entered that great forest, proceeding on their cars drawn by their excellent steeds whose thirst had been assuaged. That forest abounded with diverse kinds of animals, and it teemed with various species of birds. And it was covered with many trees and creepers and was infested by numerous carnivorous creatures. Covered with many pieces of water and adorned with various kinds of flowers, it had many lakes overgrown with blue lotuses. Having entered that dense forest, they cast their eyes about and saw a gigantic banyan tree with thousands of branches. Repairing to the shade of that tree, those great car-warriors, O king, those foremost of men, saw that was the biggest tree in that forest. Alighting from their cars, and letting loose their animals, they cleansed themselves duly and said their evening prayers. The Sun then reached the Asta mountains, and Night, the mother of the universe, came. The firmament, bespangled with planets and stars, shone like an ornamented piece of brocade and presented a highly agreeable spectacle. Those creatures that walk the night began to howl and utter their cries at will, while they that walk the day owned the influence of sleep. Awful became the noise of the night-wandering animals. The carnivorous creatures became full of glee, and the night, as it deepened, became dreadful. At that hour, filled with grief and sorrow, Kritavarma and Kripa and Drona's son all sat down together. Seated under that banyan, they began to give expression to their sorrow in respect of that very matter: the destruction that had taken place of both the Kurus and the Pandavas. Heavy with sleep, they laid themselves down on the bare earth. They had been exceedingly tired and greatly mangled with shafts. The two great car-warriors, Kripa and Kritavarma, succumbed to sleep. However deserving of happiness and undeserving of misery, they then lay stretched on the bare ground. Indeed, O monarch, those two who had always slept on costly beds now slept, like helpless persons, on the bare ground, afflicted with toil and grief. Drona's son, however, O Bharata, yielding to the influence of wrath and reverence, could not sleep, but continued to breathe like a snake. Burning with rage, he could not get a wink of slumber. That hero of mighty arms cast his eyes on every side of that terrible forest. As he surveyed that forest peopled with diverse kinds of creatures, the great warrior beheld a large banyan covered with crows. On that banyan thousands of crows roosted in the night. Each perching separately from its neighbour, those crows slept at ease, O Kauravya! As, however, those birds were sleeping securely on every side, Ashvatthama beheld an owl of terrible aspect suddenly make its appearance there. Of frightful cries and gigantic body, with green eyes and tawny plumage, its nose was very large and its talons were long. And the speed with which it came resembled that of Garuda. Uttering soft cries that winged creature, O Bharata, secretly approached the branches of that banyan. That ranger of the sky, that slayer of crows, alighting on one of the branches of the banyan, slew a large number of his sleeping enemies. He tore the wings of some and cut off the heads of others with his sharp talons and broke the legs of many. Endued with great strength, he slew many that fell down before his eyes. With the limbs and bodies, O monarch, of the slain crows, the ground covered by the spreading branches of the banyan became thickly strewn on every side. Having slain those crows, the owl became filled with delight like a slayer of foes after having behaved towards his foes according to his pleasure. Beholding that highly suggestive deed perpetrated in the night by the owl, Drona's son began to reflect on it, desirous of framing his own conduct by the light of that example. He said unto himself, "This owl teaches me a lesson in battle. Bent as I am upon the destruction of the foe, the time for the deed has come! The victorious Pandavas are incapable of being slain by me! They are possessed of might, endued with perseverance, sure of aim, and skilled in smiting. In the presence, however, of the king I have vowed to slay them. I have thus pledged myself to a self-destructive act, like an insect essaying to rush into a blazing fire! If I were to fight fairly with them, I shall, without doubt, have to lay down my life! By an act of guile, however, success may yet be mine and a great destruction may overtake my foes! People generally, as also those versed in the scriptures, always applaud those means which are certain over those which are uncertain. Whatever of censure and evil repute this act may provoke ought to be incurred by person that is observant of kshatriya practices. The Pandavas of uncleansed souls have, at every step, perpetrated very ugly and censurable acts that are again fall of guile. As regards this matter, certain ancient verses, full of truth, are heard, sung by truth-seeing and righteousness-observing persons, who sang them after a careful consideration of the demands of justice. These verses are even these: ‘The enemy's force, even when fatigued, or wounded with weapons, or employed in eating, or when retiring, or when resting within their camp, should be smitten. They should be dealt with in the same way when afflicted with sleep in the dead of night, or when reft of commanders, or when broken or when under the impression of an error.'" Having reflected in this way, the valiant son of Drona formed the resolution of slaying during the night the slumbering Pandavas and the Pancalas. Having formed this wicked resolution and pledged himself repeatedly to its execution, he awoke both his maternal uncle and the chief of Bhojas. Awakened from sleep, those two illustrious and mighty persons, Kripa and the Bhoja chief, heard Ashvatthama's scheme. Filled with shame, both of them abstained from giving a suitable reply. Having reflected for a short while, Ashvatthama said with tearful eyes, "King Duryodhana, that one hero of great might, for whose sake we were waging hostilities with the Pandavas, hath been slain! Deserted and alone, though he was the lord of eleven akshauhinis of troops, that hero of unstained prowess hath been struck down by Bhimasena and a large number of wretches banded together in battle! Another wicked act hath been perpetrated by the vile Vrikodara, for the latter hath touched with his foot the head of a person whose coronal locks underwent the sacred bath! The Pancalas are uttering loud roars and cries and indulging in loud bursts of laughter. Filled with joy, they are blowing their conchs and beating their drums! The loud peal of their instruments, mingled with the blare of conchs, is frightful to the ear and borne by the winds, is filling all the points of the compass. Loud also is the din made by their neighing steeds and grunting elephants and roaring warriors! That deafening noise made by the rejoicing warriors as they are marching to their quarters, as also the frightful clatter of their car-wheels, comes to us from the east. So great hath been the havoc made by the Pandavas on the Dhartarashtras that we three are the only survivors of that great carnage! Some were endued with the might of a hundred elephants, and some were masters of all weapons. Yet have they been slain by the sons of Pandu! I regard this to be an instance of the reverses brought about by Time! Truly, this is the end to which such an act leads! Truly, although the Pandavas have achieved such difficult feats, even this should be the result of those feats! If your wisdom hath not been driven away by stupefaction, then say what is proper for us to do in view of this calamitous and grave affair.'" Kripa said, "We have heard all that thou hast said, O puissant one! Listen, however, to a few words of mine, O mighty armed one! All men are subjected to and governed by these two forces, Destiny and Exertion. There is nothing higher than these two. Our acts do not become successful in consequence of destiny alone, nor of exertion alone, O best of men! Success springs from the union of the two. All purposes, high and low, are dependent on a union of those two. In the whole world, it is through these two that men are seen to act as also to abstain. What result is produced by the clouds pouring upon a mountain? What results are not produced by them pouring upon a cultivated field? Exertion, where destiny is not auspicious, and absence of exertion where destiny is auspicious, both these are fruitless! What I have said before (about the union of the two) is the truth. If the rains properly moisten a well-tilled soil, the seed produces great results. Human success is of this nature. Sometimes, Destiny, having settled a course of events, acts of itself (without waiting for exertion). For all that, the wise, aided by skill have recourse to exertion. All the purposes of human acts, O bull among men, are accomplished by the aid of those two together. Influenced by these two, men are seen to strive or abstain. Recourse may be had to exertion. But exertion succeeds through destiny. It is in consequence also of destiny that one who sets himself to work, depending on exertion, attains to success. The exertion, however, of even a competent man, even when well directed, is without the concurrence of destiny, seen in the world to be unproductive of fruit. Those, therefore, among men, that are idle and without intelligence, disapprove of exertion. This however, is not the opinion of the wise. Generally, an act performed is not seen to be unproductive of fruit in the world. The absent of action, again, is seen to be productive of grave misery. A person obtaining something of itself without having made any efforts, as also one not obtaining anything even after exertion, is not to be seen. One who is busy in action is capable of supporting life. He, on the other hand, that is idle, never obtains happiness. In this world of men it is generally seen that they that are addicted to action are always inspired by the desire of earning good. If one devoted to action succeeds in gaining his object or fails to obtain the fruit of his acts, he does not become censurable in any respect. If anyone in the world is seen to luxuriously enjoy the fruits of action without doing any action, he is generally seen to incur ridicule and become an object of hatred. He who, disregarding this rule about action, liveth otherwise, is said to do an injury to himself. This is the opinion of those that are endued with intelligence. Efforts become unproductive of fruits in consequence of these two reasons: destiny without exertion and exertion without destiny. Without exertion, no act in this world becomes successful. Devoted to action and endued with skill, that person, however, who, having bowed down to the gods, seeks, the accomplishment of his objects, is never lost. The same is the case with one who, desirous of success, properly waits upon the aged, asks of them what is for his good, and obeys their beneficial counsels. Men approved by the old should always be solicited for counsel while one has recourse to exertion. These men are the infallible root of means, and success is dependent on means. He who applies his efforts after listening to the words of the old, soon reaps abundant fruits from those efforts. That man who, without reverence and respect for others (capable of giving him good counsel), seeks the accomplishment of his purposes, moved by passion, anger, fear, and avarice, soon loses his prosperity. This Duryodhana, stained by covetousness and bereft of foresight, had without taking counsel, foolishly commenced to seek the accomplishment of an undigested project. Disregarding all his well-wishers and taking counsel with only the wicked, he had, though dissuaded, waged hostilities with the Pandavas who are his superiors in all good qualities. He had, from the beginning, been very wicked. He could not restrain himself. He did not do the bidding of friends. For all that, he is now burning in grief and amid calamity. As regards ourselves since we have followed that sinful wretch, this great calamity hath, therefore, overtaken us! This great calamity has scorched my understanding. Plunged in reflection, I fail to see what is for our good! A man that is stupefied himself should ask counsel of his friends. In such friends he hath his understanding, his humility, and his prosperity. One's actions should have their root in them. That should be done which intelligent friends, having settled by their understanding, should counsel. Let us, therefore, repair to Dhritarashtra and Gandhari and the high-souled Vidura and ask them as what we should do. Asked by us, they will say what, after all this, is for our good. We should do what they say. Even this is my certain resolution. Those men whose acts do not succeed even after the application of exertion, should, without doubt, be regarded as afflicted by destiny." Sanjaya said, "Hearing these words of Kripa that were auspicious and fraught with morality and profit, Ashvatthama, O monarch, became overwhelmed with sorrow and grief. Burning with grief as if with a blazing fire, he formed a wicked resolution and then addressed them both saying, "The faculty of understanding is different in different men. Each man, however, is pleased with own understanding. Every man regards himself more intelligent than others. Everyone respects his own understanding and accords it great praise. Everyone's own wisdom is with every one a subject of praise. Everyone speaks ill of the wisdom of others, and well of his own, in all instances. Men whose judgements agree with respect to any unattained object, even though there be a variety of considerations, become gratified with and applaud one another. The judgements, again, of the same men, overwhelmed with reverses through the influence of time, become opposed to one another. More particularly, in consequence of the diversity of human intellects, judgements necessarily differ when intellects are clouded. As a skilful physician, having duly diagnosed a disease, prescribes a medicine by the application of his intelligence for effecting a cure, even so men, for the accomplishment of their acts, use their intelligence, aided by their own wisdom. What they do is again disapproved by others. A man, in youth, is affected by one kind of understanding. In middle age, the same does not prevail with him, and in the period of decay, a different kind of understanding becomes agreeable to him. When fallen into terrible distress or when visited by great prosperity, the understanding of a person, O chief of the Bhojas, is seen to be much afflicted. In one and the same person, through want of wisdom, the understanding becomes different at different times. That understanding which at one time is acceptable becomes the reverse of that at another time. Having resolved, however, according to one's wisdom, that resolution which is excellent should be endeavoured to be accomplished. Such resolution, therefore, should force him to put forth exertion. All persons, O chief of the Bhojas, joyfully begin to act, even in respect of enterprises that lead to death, in the belief that those enterprises are achievable by them. All men, relying on their own judgements and wisdom, endeavour to accomplish diverse purposes, knowing them to be beneficial. The resolution that has possessed my mind today in consequence of our great calamity, as something that is capable of dispelling my grief, I will now disclose unto both of you. The Creator, having formed his creatures, assigned unto each his occupation. As regards the different orders, he gave unto each a portion of excellence. Unto brahmanas he assigned that foremost of all things, the Veda. Unto the kshatriya he assigned superior energy. Unto the vaishya he gave skill, and unto the shudra he gave the duty of serving the three other classes. Hence, a brahmana without self-restraint is censurable. A kshatriya without energy is base. A vaishya without skill is worthy of dispraise, as also a shudra who is bereft of humility (to the other orders). I am born in an adorable and high family of brahmanas. Through ill-luck, however, I am wedded to kshatriya practices. If, conversant as I am with kshatriya duties, I adopt now the duties of a brahmana and achieve a high object (the purification of self under such injuries), that course would not be consistent with nobleness. I hold an excellent bow and excellent weapons in battle. If I do not avenge the slaughter of my sire, how shall I open my mouth in the midst of men? Paying regard to kshatriya duties, therefore, without hesitation, I shall today walk in the steps of my high-souled sire and the king. The Pancalas, elated with victory, will trustfully sleep tonight, having put off their armour and in great glee, and filled with happiness at the thought of the victory they have won, and spent with toil and exertion. While sleeping at their ease during the night within their own camp, I shall make a great and terrible assault upon their camp. Like Maghavat slaying the danavas, I shall, attacking them while senseless and dead in sleep in their camp, slay them all, putting forth my prowess. Like a blazing fire consuming a heap of dry grass, I shall slay all of them assembled in one place with their leader Dhrishtadyumna! Having slain the Pancalas, I shall obtain peace of mind, O best of men! While engaged in the act of slaughter, I shall career in their midst like the wielder of Pinaka, Rudra himself, in rage among living creatures. Having cut off and slain all the Pancalas today, I shall then, in joy, afflict the sons of Pandu in battle. Taking their lives one after another and causing the earth to be strewn with the bodies of all the Pancalas, I shall pay off the debt I owe to my sire. I shall today make the Pancalas follow in the wake, hard to tread, of Duryodhana and Karna and Bhishma, and the ruler of the Sindhus. Putting forth my might, I shall tonight grind the head, like that of any animal, of Dhrishtadyumna, the king of the Pancalas! I shall tonight, O son of Gautama, cut off with my sharp sword, in battle, the sleeping sons of the Pancalas and the Pandavas. Having exterminated the Pancalas army tonight while sunk in sleep, I shall, O thou of great intelligence, obtain great happiness and regard myself to have done my duty!" Kripa said, "By good luck, O thou of unfading glory, thy heart is set today on vengeance. The wielder of the thunder himself will not succeed in dissuading thee today. Both of us, however, shall accompany thee in the morning. Putting off thy armour and taking down thy standard, take rest for this night. I shall accompany thee, as also Kritavarma of the Satvata race, clad in mail and riding on our cars, while thou shalt proceed against the foe. United with ourselves, thou shalt slay the foes, the Pancalas with all their followers, tomorrow in press of battle, putting forth thy prowess, O foremost of car-warriors! If thou puttest forth thy prowess, thou art quite competent to achieve that fear! Take rest, therefore, for this night. Thou hast kept thyself awake for many a night. Having rested and slept, and having become quite refreshed, O giver of honours, encounter the foe in battle! Thou shalt then slay the enemy, without doubt. No one, not even Vasava amongst the gods, would venture to vanquish thee armed with foremost of weapons, O first of car-warriors! Who is there that would, even if he be the chief of the gods himself, fight Drona's son, when the latter proceeds, accompanied by Kripa and protected by Kritavarma? Therefore, having rested and slept this night and shaken off fatigue, we shall slay the foe tomorrow morning! Thou art a master of celestial weapons. I also am so, without doubt. This hero of Satvata's race is a mighty bowman, always skilled in battle. All of us, uniting together, O son, shall succeed in slaying our assembled foes in battle by putting forth our might. Great shall be our happiness then! Dispelling thy anxieties, rest for this night and sleep happily! Myself and Kritavarma, both armed with bows and capable of scorching our enemies, will, clad in mail, follow thee, O best of men, while thou shalt proceed on thy car against the enemy. Proceeding to their camp and proclaiming thy name in battle, thou shalt then make a great slaughter of the foe. Tomorrow morning, in broad daylight, having caused a great slaughter among them thou shalt sport like Shakra after the slaughter of great asuras. Thou art quite competent to vanquish the army of the Pancalas in battle like the slayer of the danavas in vanquishing in rage the danava host. United with myself in battle and protected by Kritavarma, thou art incapable of being withstood by the wielder of the thunderbolt himself. Neither I, O son, nor Kritavarma, will ever retreat from battle without having vanquished the Pandavas! Having slain the angry Pancalas along with the Pandavas, we shall come away, or slain by them, we shall proceed to heaven. By every means in our power, we two shall render thee assistance in battle tomorrow morning. O thou of mighty arms, I tell thee the truth, O sinless one!" Addressed in these beneficial words by his maternal uncle, the son of Drona, with eyes red in rage, answered his uncle, O king, saying, ‘Where can a person that is afflicted, or one that is under the influence of rage, or one whose heart is always engaged in revolving projects for the acquisition of wealth, or one that is under the power of lust, obtain sleep? Behold, all these four causes are present in my case. Anyone of these, singly would destroy sleep. How great is the grief of that person whose heart is always thinking of the slaughter of his sire! My heart is now burning day and night. I fail to obtain peace. The way in which my sire in particular was slain by those sinful wretches hath been witnessed by you all. The thought of that slaughter is cutting all my vitals. How could a person like me live for even a moment after hearing the Pancalas say that they have slain my father? I cannot bear the thought of supporting life without having slain Dhrishtadyumna in battle. In consequence of the slaughter of my father he hath become slayable by me, as also all with whom he is united. Who is there so hard-hearted that would not burn after having heard the lamentations that I have heard of the king lying with broken thighs? Who is there so destitute of compassion whose eyes would not be filled with tears after hearing such words uttered by the king with broken thighs? They whose side was adopted by me have been vanquished. The thought of this enhances my sorrow as a rush of waters enhances the sea. Protected as they are by Vasudeva and Arjuna, I regard them, O uncle, to be irresistible by the great Indra himself. I am unable to restrain this rising wrath in my heart. I do not behold the man in this world that can assuage this wrath of mine! The messengers informed me of the defeat of my friends and the victory of the Pandavas. That is burning my heart. Having however, caused a slaughter of my enemies during their sleep, I shall then take rest and shall then sleep without anxiety." Kripa said, "A person who is bereft of intelligence and who hath not his passions under control, cannot, even if he waits dutifully upon his superiors, understand all the considerations of morality. This is my opinion. Similarly, an intelligent person who does not practise humility fails to understand the settled conclusions of morality. A brave man, if bereft of understanding, by waiting all his life upon a learned person fails to know his duties, like a wooden ladle unable to taste the juicy soup (in which it may lie immersed). The wise man, however, by waiting upon a learned person for even a moment, succeeds in knowing his duties, like the tongue tasting the juicy soup (as soon as it comes into contact with the latter). That person who is endued with intelligence, who waits upon his superiors, and who has his passions under control succeeds in knowing all the rules of morality and never disputes with what is accepted by all. An ungovernable, irreverent, and sinful person of wicked soul perpetrates sin in seeking his well-being by disregarding destiny. Well-wishers seek to restrain a friend from sin. He who suffers himself to be dissuaded, succeeds in winning prosperity. He that does otherwise reaps misery. As a person of disordered brains is restrained by soothing words, even so should a friend be restrained by well-wishers. He that suffers himself to be so restrained never becomes a prey to misery. When a wise friend is about to perpetrate a wicked act, well-wishers possessed of wisdom repeatedly and according to the extent of their power endeavour to restrain him. Setting thy heart on what is truly beneficial, and restraining thyself by thy own self, do my bidding, O son, so that thou mayst not have to repent afterwards. In this world, the slaughter of sleeping persons is not applauded, agreeably to the dictates of religion. The same is the case with persons that have laid down their arms and come down from cars and steeds. They also are unslayable who say ‘We are thine!' and they that surrender themselves, and they whose locks are dishevelled, and they whose animals have been killed under them or whose cars have been broken. All the Pancalas will sleep tonight. O lord, divesting themselves of armour. Trustfully sunk in sleep, they will be like dead men. That crooked-minded man who would wage hostility with them then, it is evident, would sink in deep and limitless hell without a raft save himself. In this world thou art celebrated as the foremost of all persons conversant with weapons. Thou hast not as yet committed even a minute trespass. When the sun rises next morning and light shall discover all things, thyself, like a second sun in effulgence wilt conquer the foe in battle. This censurable deed, so impossible in one like thee, will look like a red spot on a white sheet. Even this is my opinion." Ashvatthama said, "Without doubt, it is even so, O maternal uncle, as thou sayest. The Pandavas, however, have before this broken the bridge of righteousness into a hundred fragments. In the very sight of all the kings, before thy eyes also, my sire, after he had laid down his weapons, was slain by Dhrishtadyumna. Karna also, that foremost of car-warriors, after the wheel of his car had sunk and he had been plunged into great distress, was slain by the wielder of gandiva. Similarly, Shantanu's son Bhishma, after he had laid aside his weapons and become disarmed, was slain by Arjuna with Shikhandi placed in his van. So also, the mighty bowman Bhurishrava, while observant of the praya vow on the field of battle, was slain by Yuyudhana in total disregard of the cries of all the kings! Duryodhana too, having encountered Bhima in battle with the mace, hath been slain unrighteously by the former in the very sight of all the lords of earth. The king was all alone in the midst of a large number of mighty car-warriors standing around him. Under such circumstances was that tiger among men slain by Bhimasena. Those lamentations that I have heard, of the king lying prostrate on the earth with his thighs broken, from the messengers circulating the news, are cutting the very core of my heart. The unrighteous and sinful Pancalas, who have broken down the barrier of virtue, are even such. Why do you not censure them who have transgressed all considerations? Having slain the Pancalas, those slayers of my sire, in the night when they are buried in sleep, I care not if I am born a worm or a winged insect in my next life. That which I have resolved is hurrying me towards its accomplishment. Hurried as I am by it, how can I have sleep and happiness? That man is not yet born in the world, nor will be, who will succeed in baffling this resolution that I have formed for their destruction." Sanjaya continued, "Having said these words, O monarch, the valiant son of Drona yoked his steeds to his car at a corner and set out towards the direction of his enemies. Then Bhoja and Sharadvata's son, those high-souled persons, addressed him, saying, "Why dost thou yoke the steeds to thy car? Upon what business art thou bent? We are determined to accompany thee tomorrow, O bull among men! We sympathise with thee in weal and woe. It behoveth thee not to mistrust us. Remembering the slaughter of his sire, Ashvatthama in rage told them truly about the feat that he had resolved to accomplish. When my sire, having slain hundreds and thousands of warriors with keen shafts, had laid aside his weapons, he was then slain by Dhrishtadyumna. I shall slay that slayer today in a similar condition that is, when he will have laid aside his armour. The sinful son of the king of the Pancalas I shall today slay by a sinful act. It is my resolve to slay like an animal that sinful prince of the Pancalas in such a way that he may not attain to regions earned by persons slain with weapons! Put on your coats of mail without delay and take your bows and swords, and wait for me here, ye foremost of car-warrior and scorchers of foes." Having said these words, Ashvatthama got upon his car and set out towards the direction of the enemy. Then Kripa, O king, and Kritavarma of the Satvata race, both followed him. While the three proceeded against the enemy, they shone like three blazing fires in a sacrifice, fed with libations of clarified butter. They proceeded, O lord, towards the camp of the Pancalas within which everybody was asleep. Having approached the gate, Drona's son, that mighty car-warrior, stopped." Dhritarashtra said, "Seeing Drona's son stop at the gate of the encampment, what, O Sanjaya, did those two mighty car-warriors, Kripa and Kritavarma, do? Tell me this!" Sanjaya said, "Inviting Kritavarma, as also the mighty car-warrior Kripa, Drona's son, filled with rage, approached the gate of the camp. He there beheld a being of gigantic frame, capable of making the very hair stand on end, and possessed of the effulgence of the Sun or the Moon, guarding the entrance. Round his loins was a tiger-skin dripping with blood, and he had a black deer for his upper garment. He had for his sacred thread a large snake. His arms were long and massive and held many kinds of uplifted weapons. He had for his angadas a large snake wound round his upper arm. His mouth seemed to blaze with flames of fire. His teeth made his face terrible to behold. His mouth was open and dreadful. His face was adorned with thousands of beautiful eyes. His body was incapable of being described, as also his attire. The very mountains, upon beholding him, would split into a 1,000 fragments. Blazing flames of fire seemed to issue from his mouth and nose and ears and all those thousands of eyes. From those blazing flames hundreds and thousands of Hrishikeshas issued, armed with conchs and discs and maces. Beholding that extraordinary being capable of inspiring the whole world with terror, Drona's son, without feeling any agitation, covered him with showers of celestial weapons. That being, however, devoured all those shafts shot by Drona's son. Like the vadava fire devouring the waters of the ocean, that being devoured the shafts sped by the son of Drona. Beholding his arrowy showers prove fruitless, Ashvatthama hurled at him a long dart blazing like a flame of fire. That dart of blazing point, striking against that being, broke into pieces like a huge meteor at the end of the yuga breaking and falling down from the firmament after striking against the Sun. Ashvatthama then, without losing a moment, drew from its sheath an excellent scimitar of the colour of the sky and endued with a golden hilt. The scimitar came out like a blazing snake from its hole. The intelligent son of Drona then hurled that excellent scimitar at that being. The weapon, approaching that being, disappeared within his body like a mongoose disappearing in its hole. Filled with rage, the son of Drona then hurled a blazing mace of the proportions of a pole set up in honour of Indra. The being devoured that mace also. At last, when all his weapons were exhausted Ashvatthama, casting his eyes around, beheld the whole firmament densely crowded with images of Janardana. Drona's son, divested of weapons, beholding that wonderful sight, recollected the words of Kripa, and turning pale with grief, said, "He that listens not to the beneficial words of advising friends is obliged to repent, being overwhelmed with calamity, even as my foolish self for having disregarded my two well-wishers. That fool who, disregarding the way pointed out by the scriptures, seeketh to slay his enemies, falleth off from the path of righteousness and is lost in the trackless wilderness of sin. One should not cast weapons upon kine, brahmanas, kings, women, friends, one's own mother, one's own preceptor, a weak man, an idiot, a blind man, a sleeping man, a terrified man, one just arisen from sleep, an intoxicated person, a lunatic and one that is heedless. The preceptors of old always inculcated this truth upon men. I have, however, by disregarding the eternal way pointed out by the scriptures, and by essaying to tread in a wrong path, fallen into terrible distress. The wise have called that to be a terrible calamity when one falls back, through fear, from a great feat after having essayed to achieve it. I am unable, by putting forth only my skill and might, to achieve that which I have vowed. Human exertion is never regarded more efficacious than destiny. If any human action that is commenced does not succeed through destiny, the actor becomes like one who falling off from the path of righteousness, is lost in the wilderness of sin. The sages speak of defeat as foolishness when one having commenced an act swerves from it through fear. In consequence of the wickedness of my essay, this great calamity has come upon me, otherwise Drona's son would never had been forced to hold back from battle. This being, again whom I see before me, is most wonderful! He stands there like the uplifted rod of divine chastisement. Reflecting even deeply, I cannot recognise who this being is. Without doubt, that being is the terrible fruit of this sinful determination of mine that I had essayed to achieve unrighteously. He standeth there for baffling that determination. It seems, therefore, that in my case this falling off from fight had been ordained by destiny. It is not for me to exert for the accomplishment of this my purpose unless destiny becomes favourable. I shall, therefore, at this hour, seek the protection of the puissant Mahadeva! He will dispel this dreadful rod of divine chastisement uplifted before me. I will take the shelter of that god, that source of everything beneficial, the lord of Uma, otherwise called Kapardin, decked with a garland of human skulls, that plucker of Bhaga's eyes called also Rudra and Hara. In ascetic austerities and prowess, he far surpasses all the gods. I shall, therefore, seek the protection of Girisha armed with the trident." Sanjaya said, "The son of Drona, O monarch, having reflected thus, descended from the terrace of his car and stood, bending his head unto that supreme god. And he said, "I seek the protection of Him called Ugra, Sthanu, Shiva, Rudra, Sharva, Ishana, Ishvara, Girisha; and of that boon-giving god who is the Creator and Lord of the universe; of Him whose throat is blue, who is without birth, who is called Shakra, who destroyed the sacrifice of Daksha, and who is called Hara; of Him whose form is the universe, who hath three eyes, who is possessed of multifarious forms, and who is the lord of Uma; of Him who resides in crematoriums, who swells with energy, who is the lord of diverse tribes of ghostly beings, and who is the possessor of undecaying prosperity and power; of Him who wields the skull-topped club, who is called Rudra, who bears matted locks on his head, and who is a brahmacari. Purifying my soul that is so difficult to purify, and possessed as I am of small energy, I adore the Destroyer of the triple city, and offer myself as the victim. Hymned thou hast been, deserving art thou of hymns, and I hymn to thy glory! Thy purposes are never baffled. Thou art robed in skins; thou hast red hair on thy head; thou art blue-throated; thou art unbearable; thou art irresistible! Thou art pure; thou art the Creator of Brahman; thou art Brahma; thou art a brahmacari; thou art an observer of vows; thou art devoted to ascetic austerities; thou art infinite; thou art the refuge of all ascetics; thou art multiform; thou art the leader of diverse tribes of ghostly beings; thou art three-eyed; thou art fond of those beings called companions; thou art always seen by the Lord of treasures; thou art dear to Gauri's heart; thou art the sire of Kumara; thou art tawny; thou hast for thy excellent bearer a bovine bull; thou art robed in a subtle attire; thou art most fierce; thou art eager to adorn Uma; thou art higher than all that is high; thou art higher than everything; there is nothing higher than thou; thou art the wielder of weapons; thou art immeasurable, and thou art the protector of all quarters; thou art cased in golden armour; thou art divine; thou hast the moon as an ornament on thy brow! With concentrated attention, I seek thy protection, O god! For success in getting over this dreadful distress that is so difficult to get over, I sacrifice unto thee, the purest of the pure, offering for thy acceptance the (five) elements of which my body is composed!" Knowing this to be his resolution in consequence of his desire to accomplish his object, a golden altar appeared before the high-souled son of Drona. Upon the altar, O king, appeared a blazing fire, filling all the points of the compass, cardinal and subsidiary, with its splendour. Many mighty beings also, of blazing mouths and eyes, of many feet, heads, and arms, adorned with angadas set with gems, and with uplifted arms, and looking like elephants and mountains, appeared there. Their faces resembled those of hares and boars and camels and horses and jackals and cows and bears and cats and tigers and pards and crows and apes and parrots. And the faces of some were like those of mighty snakes, and others had faces like those of ducks. And all of them were endued with great effulgence. And the faces of some were like those of woodpeckers and jays, O Bharata, and of tortoises and alligators and porpoises and huge sharks and whales, and of lions and cranes and pigeons and elephants and stags. Some had faces like those of ravens and hawks, some had ears on their hands; some had a 1,000 eyes, some had very large stomachs, and some had no flesh, O Bharata! And some, O king, had no heads, and some, O Bharata, had faces like those of bears. The eyes of some were like fire, and some had fiery complexions. The hair on the heads and bodies of some were blazing and some had four arms, and some, O king, had faces like those of sheep and goats. The colour of some was like that of conchs, and some had faces that resembled conchs, and the ears of some were like conchs, some wore garlands made of conchs, and the voices of some resembled the blare of conchs. Some had matted locks on their heads, and some had five tufts of hair, and some had heads that were bald. Some had lean stomachs; some had four teeth, some had four tongues, some had ears straight as arrows and some had diadems on their brows. Some had strings of grass on their bodies, O monarch, and some had curly hair. Some had head-gears made of cloth, some had coronets, some had beautiful faces, and some were adorned with ornaments. Some had ornaments made of lotuses, and some were decked with flowers. They numbered in hundreds and thousands. Some were armed with shataghnis, some with thunder, and some had mushalas in their hands. 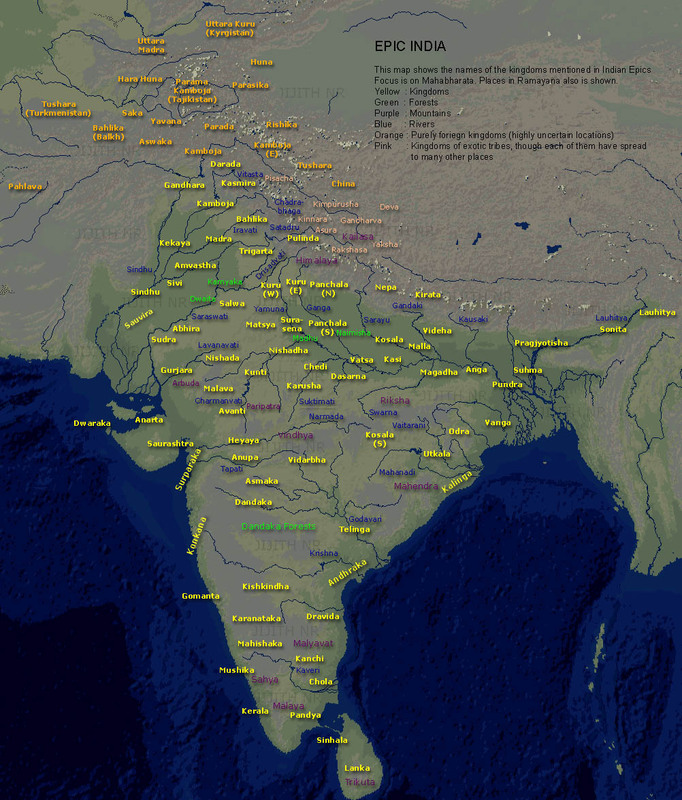 Some had bhushundis, some had nooses, and some had maces in their hands, O Bharata! On the backs of some were slung quivers containing excellent shafts, and all were fierce in battle. Some had standards with banners and bells, and some were armed with battle-axes. Some had large nooses in their uplifted arms, and some had clubs and bludgeons. Some had stout posts in their hands, some had scimitars, and some had snakes with erect heads for their diadems. Some had large snakes (wound round their upper arms) for angadas, and some had beautiful ornaments on their persons. Some were begrimed with dust, some smutted with mire, and all were attired in white robes and white garments. The limbs of some were blue, while others had limbs that were tawny. And some there were that were beardless. Those beings, called companions, possessed of golden complexions, and filled with joy, played upon drums and horns and cymbals and jharjharas and anakas and gomukhas. And some sang and some danced about uttering loud sounds, and some leapt forward and cut capers and jumped sideways. Endued with great fleetness, they ran about most fiercely, the hair on their heads waving in the air, like huge elephants infuriated with passion and frequently uttering loud roars. Terrible, and of frightful mien and armed with lances and battle-axes, they were attired in robes of diverse hues and decked with beautiful garlands and unguents. Adorned with angadas decked with gems, and with uplifted arms, they were endued with great courage. Capable of forcibly slaying all foes, they were irresistible in prowess. Drinkers of blood and fat and other animal matter, they subsisted on the flesh and entrails of animals. Some had their locks tied in tall tufts above their heads. Some had single tufts on their heads; some had rings on their ears; and some had stomachs resembling earthen vessels used for cooking. Some were of very short statures, and some were very high in stature. Some were tall and very fierce. Some had grim features, some had long lips, and the genital limbs of some were very long. Some had costly and diverse kinds of crowns upon their heads; and some had bald heads, and the heads of others were covered with matted locks. They were capable of bringing down the firmament with the sun, moon, and stars, on earth, and exterminating the four orders of created things. They know not what it is to fear, and are capable of enduring the frowns of Hara. They always act as they like, and are the lords of the lords of the three worlds. Always engaged in merry sports, they are thorough masters of speech and are perfectly free from pride. Having obtained the eight kinds of divine attributes, they are never elated with pride. The divine Hara is always filled with wonder at their feats. They are devout worshippers of Mahadeva. Adored by them in thought, word, and deed, the great god protects those worshippers of his, looking upon them, in thought, word, and deed as children of his own loins. Filled with rage, they always drink the blood and fat of all haters of Brahma. They always drink also the soma juice endued with four kinds of taste. Having adored the trident-bearing god with Vedic recitations, with brahmacarya, with austerities, and with self-restraint, they have obtained the companionship of Bhava. The divine Maheshvara, that lord of the past, the present, and the future as also Parvati, eat with those diverse tribes of mighty beings that partake of their own nature. Causing the universe to resound with the peal of diverse kinds of instruments, with noise of laughter, with loud sounds and shrieks and leonine roar, they approached Ashvatthama. Uttering the praises of Mahadeva and spreading an effulgent light all around, desirous of enhancing the honour of Ashvatthama and the glory of the high-souled Hara, and wishing to ascertain the extent of Ashvatthama's energy, and desirous also of beholding the slaughter during the hour of sleep, armed with terrible and fierce bludgeons and fiery wheels and battle-axes, that crowd of strange beings, endued with terrible forms, came from every side. They were capable of inspiring the three worlds with dread at their sight. The mighty Ashvatthama, however, beholding them, felt no fear. Drona's son, armed with bow, and with fingers cased in fences made of iguana skins, himself offered up his own self as a victim unto Mahadeva. Bows were the fuel, and sharp shafts were the ladles, and his own soul possessed of great might was the libation, O Bharata, in that act of sacrifice. The valiant and wrathful son of Drona then, with propitiating mantras, offered up his own soul as the victim. Having with fierce rites adored Rudra of fierce deeds, Ashvatthama with joined hands, said these words unto that high-souled god. Ashvatthama said, "Sprung from Angirasa's line, I am about to pour my soul, O god, as a libation on this fire! Accept, O lord, this victim! In this hour of distress, O Soul of the universe, I offer up my own self as the sacrificial victim, from devotion to thee and with heart concentrated in meditation! All creatures are in thee and thou art in all creatures! Assemblage of all high attributes occur in thee! O lord, O thou art the refuge of all creatures. I wait as a libation for thee, since I am unable to vanquish my foes. Accept me, O god." Having said these words, Drona's son, ascending that sacrificial altar on which a fire blazed brightly, offered himself up as the victim and entered that blazing fire. Beholding him stand immovable and with uplifted hands and as an offering up to himself, the divine Mahadeva appeared in person and smilingly said, "With truth, purity, sincerity, resignation, ascetic austerities, vows, forgiveness, devotion, patience, thought, and word, I have been duly adored by Krishna of pure deeds. For this there is none dearer to me than Krishna. For honouring him and at his word I have protected the Pancalas and displayed diverse kinds of illusion. By protecting the Pancalas I have honoured him. They have, however, been afflicted by time. The period of their lives hath run out." Having said these words unto the high-souled Ashvatthama, the divine Mahadeva entered Ashvatthama's body after giving him an excellent and polished sword. Filled by that divine being, Drona's son blazed up with energy. In consequence of that energy derived from godhead, he became all-powerful in battle. Many invisible beings and rakshasas proceeded along his right and his left as he set out, like the lord Mahadeva himself, for entering the camp of his foes." Dhritarashtra said, "While Drona's son, that mighty car-warrior, thus proceeded towards the hostile camp, did Kripa and Bhoja stop from fear? I hope those two car-warriors checked by vulgar guards, did not fly away secretly, thinking their opponents irresistible? Or, have they, after grinding the camp, the Somakas, and the Pandavas, followed, while still engaged in battle, the highly glorious path in which Duryodhana has gone? Are those heroes, slain by the Pancalas, sleeping on the bare Earth? Did they achieve any feat? Tell me all this, O Sanjaya!" 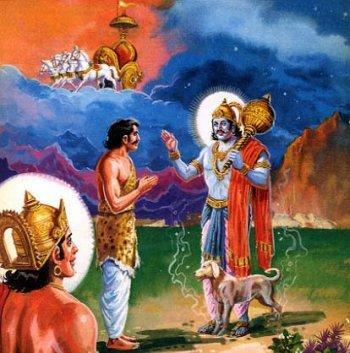 Sanjaya said, "When the high-souled son of Drona proceeded towards the camp, Kripa and Kritavarma waited at the gate. Beholding them ready to exert themselves, Ashvatthama became filled with joy, and addressing them whisperingly, O king, said, "If you two exert, you are competent to exterminate all the kshatriyas! What need I say, therefore, of this remnant of the (Pandava) army, particularly when it is buried in sleep? I shall enter the camp and career like Yama. I am sure that you two will act in such way that no man may escape you with life." Having said these words, the son of Drona entered the vast camp of the Parthas; casting off all fear, he penetrated into it by a spot where there was no door. The mighty-armed hero, having entered the camp, proceeded, guided by signs, very softly, towards the quarters of Dhrishtadyumna. The Pancalas, having achieved great feats, had been much tired in battle. They were sleeping in confidence, assembled together, and by the side of one another. Entering into Dhrishtadyumna's chamber, O Bharata, Drona's son beheld the prince of the Pancalas sleeping before him on his bed. He lay on a beautiful sheet of silk upon a costly and excellent bed. Excellent wreaths of flowers were strewn upon that bed and it was perfumed with powdered dhupa. Ashvatthama, O king, awoke with a kick the high-souled prince sleeping trustfully and fearlessly on his bed. Feeling that kick, the prince, irresistible in battle and of immeasurable soul, awaked from sleep and recognised Drona's son standing before him. As he was rising from his bed, the mighty Ashvatthama seized him by the hair of his head and began to press him down on the earth with his hands. Thus pressed by Ashvatthama with great strength, the prince, from fear as also from sleepiness, was not able to put forth his strength at that time. Striking him with his foot, O king, on both his throat and breast while his victim writhed and roared, Drona's son endeavoured to kill him as if he were an animal. The Pancala prince tore Ashvatthama with his nails and at last softly said, "O preceptor's son, slay me with a weapon, do not tarry! O best of men, let me, through thy act, repair to the regions of the righteous!" Having said this much, that slayer of foes, the son of the Pancala king, assailed with strength by that mighty hero, became silent. Hearing those indistinct sounds of his, Drona's son said, "O wretch of thy race, there is no region for those that slay their preceptors. For this, O thou of wicked understanding, thou deservest not to be slain with any weapon!" While saying so, Ashvatthama, filled with rage, began to strike the vital parts of his victim with violent kicks of his heels, and slew his foe like a lion slaying an infuriated elephant. At the cries of that hero while he was being slain, his wives and guards that were in his tent all awake, O king! Beholding somebody crushing the prince with superhuman force, they regarded the assailant to be some preternatural being and, therefore, uttered no cries from fear. Having despatched him to Yama's abode by such means, Ashvatthama of great energy went out and getting upon his beautiful car stayed on it. Indeed, coming out of Dhrishtadyumna's abode, O king, Ashvatthama caused all the points of the compass to resound with his roars, and then proceeded on his car to other parts of the camp for slaying his foes. After Drona's son, that mighty car-warrior, had gone away, the women and all the guards set up a loud wail of woe. Seeing their king slain, all the wives of Dhrishtadyumna, filled with great sorrow, cried. At that wail of theirs many mighty kshatriyas, awaking, put on their armour and came there for enquiring after the cause of those cries. Those ladies, terrified at the sight of Ashvatthama, in piteous tones asked the men to pursue him without delay. They said, "Whether he is a rakshasa or a human being, we know not what he is! Having slain the Pancala king, he stayeth there!" At these words, those foremost of warriors suddenly surrounded Drona's son. The latter slew them all by means of the rudrastra. Having slain Dhrishtadyumna and all those followers of his, he beheld Uttamauja sleeping on his bed. Attacking him with his foot on the throat and chest, Drona's son slew that great hero also while the latter writhed in agony. Yudhamanyu, coming up and believing his comrade to have been slain by a rakshasa, speedily struck Drona's son in the chest with a mace. Rushing towards him, Ashvatthama seized him and brought him down to the ground and slew him like an animal while the latter uttered loud shrieks. Having slain Yudhamanyu thus, that hero proceeded against the other car-warriors of the king, who were all asleep. He slew all those trembling and shrieking warriors like animals in a sacrifice. Taking up his sword then, he slew many others. Proceeding along the diverse paths of the camp, one after another, Ashvatthama, accomplished in the use of the sword, beheld diverse gulmas and slew in a trice the unarmed and tired warriors sleeping within them. With that excellent sword he cut off combatants and steeds and elephants. Covered all over with blood, he seemed then to be Death himself commissioned by time. Causing his foes to tremble by the repeated blows of his sword that were of three kinds, Ashvatthama became bathed in blood. Covered as he was with blood, and wielding as he did a blazing sword, his form, as he careered in battle, became exceedingly terrible and superhuman. Those who awaked from sleep, O Kaurava, became stupefied with the loud noise (they heard around). Beholding Drona's son, they looked at each other's faces and trembled (with fear). Those kshatriyas, beholding the form of that crusher of foes, believed him to be a rakshasa and closed their eyes. Of terrible form, he careered in the camp like Yama himself, and at last saw the sons of Draupadi and the remnant of the Somakas. Alarmed by the noise, and learning that Dhrishtadyumna had been slain, those mighty car-warriors, the sons of Draupadi, armed with bows, fearlessly poured their shafts on Drona's son. Awakened by their noise, the Prabhadrakas with Shikhandi at their head, began to grind the son of Drona with their arrows. Drona's son, beholding them shower their arrows on him, uttered a loud roar and became desirous of slaying those mighty car-warriors. Recollecting the death of his sire, Ashvatthama became filled with rage. Alighting from the terrace of his car, he rushed furiously (against his enemies). Taking up his bright shield with a 1,000 moons and his massive and celestial sword decked with gold, the mighty Ashvatthama rushed against the sons of Draupadi and began to lay about him with his weapon. Then that tiger among men, in that dreadful battle, struck Prativindhya in the abdomen, at which the latter, O king, deprived of life, fell down on the Earth. The valiant Sutasoma, having pierced the son of Drona with a lance, rushed at him with his uplifted sword. Ashvatthama, however cut off Sutasoma's arm with the sword in grasp, and once more struck him in the flank. At this, Sutasoma fell down, bereft of life. The valiant Shatanika, the son of Nakula, taking up a car-wheel with his two hands, violently struck Ashvatthama at the chest. The regenerate Ashvatthama violently assailed Shatanika after he had hurled that car-wheel. Exceedingly agitated, Nakula's son fell down upon the Earth, upon which Drona's son cut off his head. Then Shrutakarma, taking up a spiked bludgeon, attacked Ashvatthama. Furiously rushing at Drona's son, he assailed him violently on the left part of his forehead. Ashvatthama struck Shrutakarma with his excellent sword on the face. Deprived of senses and his face disfigured, he fell down lifeless on the Earth. At this noise, the heroic Shrutakirti, that great car-warrior, coming up, poured showers of arrows on Ashvatthama. Baffling those arrowy showers with his shield, Ashvatthama cut off from the enemy's trunk the latter's beautiful head adorned with ear-rings. Then the slayer of Bhishma, the mighty Shikhandi, with all the Prabhadrakas, assailed the hero from every side with diverse kinds of weapons. Shikhandi struck Ashvatthama with an arrow in the midst of his two eyebrows. Filled with rage at this, Drona's son, possessed of great might, approached Shikhandi and cut him into twain with his sword. Having slain Shikhandi, Ashvatthama, filled with rage, rushed furiously against the other Prabhadrakas. He proceeded also against the remnant of Virata's force. Endued with great strength, Drona's son made a heavy carnage amongst the sons, the grandsons, and the followers of Drupada, singling them out one after another. Accomplished in the use of the sword, Ashvatthama then, rushing against other combatants, cut them down with his excellent sword. The warriors in the Pandava camp beheld that Death-Night in her embodied form, a black image, of bloody mouth and bloody eyes, wearing crimson garlands and smeared with crimson unguents, attired in a single piece of red cloth, with a noose in hand, and resembling an elderly lady, employed in chanting a dismal note and standing full before their eyes, and about to lead away men and steeds and elephants all tied in a stout cord. She seemed to take away diverse kinds of spirits, with dishevelled hair and tied together in a cord, as also, O king, many mighty car-warriors divested of their weapons. On other days, O sire, the foremost warriors of the Pandava camp used to see in their dreams that figure leading away the sleeping combatants and Drona's son smiting them behind! The Pandava soldiers saw that lady and Drona's son in their dreams every night from the day when the battle between the Kurus and the Pandavas first commenced. Afflicted before by Destiny, they were now smitten by Drona's son who terrified them all with the frightful roars uttered by him. Afflicted by Destiny, the brave warriors of the Pandava camp, recollecting the sight they had seen in their dreams, identified it with what they now witnessed. At the noise made, hundreds and thousands of Pandava bowmen in the camp awoke from their slumbers. Ashvatthama cut off the legs of some, and the hips of others, and pierced some in their flanks, careering like the Destroyer himself let loose by Time. The Earth, O lord, was soon covered with human beings that were crushed into shapelessness or trodden down by elephants and steeds and with others that roared in great affliction. Many of them loudly exclaimed, "What is this?" "Who is this one?" "What is this noise?" "Who is doing what?" While uttering such shrieks, Drona's son became their Destroyer. That foremost of smiters, the son of Drona, despatched to regions of Yama all those Pandus and Srinjayas who were without armour and weapons. Terrified at that noise, many awoke from sleep. Possessed with fear, blinded by sleep, and deprived of their senses, those warriors seemed to vanish (before the fury of Ashvatthama). The thighs of many were paralysed and many were so stupefied that they lost all their energy. Shrieking and possessed with fear, they began to slay one another. Drona's son once more got upon his car of terrible clatter and taking up his bow despatched many with his shafts to Yama's abode. Others awoke from sleep, brave warriors and foremost of men, as they came towards Ashvatthama, were slain before they could approach him and were thus offered up as victims unto that Death-Night. Crushing many with that foremost of cars, he careered through the camp, and covered his foes with repeated showers of arrows. Once again with that beautiful shield of his, adorned with hundred moons, and with that sword of his which was of the hue of the welkin, he careered amidst his enemies. Like an elephant agitating a large lake, Drona's son, irresistible, in battle, agitated the camp of the Pandavas. Awaked by the noise, O king, many warriors, afflicted still with sleep and fear, and with senses still under a cloud, ran hither and thither. Many shrieked in harsh tones and many uttered incoherent exclamations. Many succeeded not in obtaining their weapons and armour. The locks of many were dishevelled, and many failed to recognise one another. Having risen from sleep, many fell down, fatigued; some wandered here and there without any purpose. Elephants and steeds, breaking their cords, passed excreta and urine. Many, causing great confusion, huddled together. Amongst these, some through fear laid themselves down on the earth. The animals of the camp crushed them there. While the camp was in this state, rakshasas, O king, uttered loud roars in joy, O chief of the Bharatas! The loud noise, O king, uttered by ghostly beings in joy, filled all the points of the compass and the welkin. Hearing the wails of woe, elephants, steeds, breaking their cords, rushed hither and thither, crushing the combatants in the camp. As those animals rushed hither and thither, the dust raised by them made the night doubly dark. When that thick gloom set in, the warriors in the camp became perfectly stupefied; sires recognised not their sons, brothers recognised not their brothers. Elephants assailing riderless elephants, and steeds assailing riderless steeds, assailed and broke and crushed the people that stood in their way. Losing all order, combatants rushed and slew one another, and felling those that stood in their way, crushed them into pieces. Deprived of their senses and overcome with sleep, and enveloped in gloom, men, impelled by fate, slew their own comrades. The guards, leaving the gates they watched, and those at duty at the outposts leaving the posts they guarded, fled away for their lives, deprived of their senses and not knowing whither they proceeded. They slew one another, the slayers, O lord, not recognising the slain. Afflicted by Fate, they cried after their sires and sons. While they fled, abandoning their friends and relatives, they called upon one another, mentioning their families and names. Other, uttering cries of "Oh!" and "Alas!" fell down on the earth. In the midst of the battle, Drona's son, recognising them, slew them all. Other kshatriyas, while being slaughtered, lost their senses, and afflicted by fear, sought to fly away from their camps. Those men that sought to fly away from their camp for saving their lives, were slain by Kritavarma and Kripa at the gate. Divested of weapons and instruments and armour, and with dishevelled hair, they joined their hands. Trembling with fear, they were on the ground. The two Kuru warriors, however, (who were on their cars) gave quarter to none. None amongst those that escaped from the camp was let off by those two wicked persons, Kripa and Kritavarma. Then again, for doing that which was highly agreeable to Drona's son, those two set fire to the Pandava camp in three places. When the camp was lighted, Ashvatthama, that delighter of his sires, O monarch, careered, sword in hand and smiting his foes with great skill. Some of his brave foes rushed towards him and some ran hither and thither. That foremost of regenerate ones, with his sword, deprived all of them of their lives. The valiant son of Drona, filled with rage, felled some of the warriors, cutting them in twain with his sword as if they were sesame stalks. The Earth, O bull of Bharata's race, became strewn with the fallen bodies of the foremost of men and steeds and elephants mingled together and uttering woeful wails and cries. When thousands of men had fallen down deprived of life, innumerable headless trunks stood up and fell down. Ashvatthama, O Bharata, cut off arms adorned with angadas and holding weapons in grasp, and heads, and thighs resembling trunks of elephants, and hands, and feet. The illustrious son of Drona mangled the backs of some, cut off the heads of some, and caused some to turn away from the fight. And he cut off some at the middle, and lopped off the ears of others, and struck others on the shoulders, and pressed down the heads of some into their trunks. As Ashvatthama careered in this way, slaughtering thousands of men, the deep night became more terrible in consequence of the darkness that set in. The earth became terrible to behold, strewn with thousands of human beings dead and dying and innumerable steeds and elephants. Cut off by the enraged son of Drona, his foes fell down on the earth that was then crowded with yakshas and rakshasas, and frightful with (broken) cars and slain steeds and elephants. Some called upon their brothers, some upon their sires, and some upon their sons. And some said, "The Dhartarashtras in rage could never accomplish such feats in battle as these which rakshasas of wicked deeds are achieving (upon us) during the hour of sleep! It is only in consequence of the absence of the Parthas that this great slaughter is going on. That son of Kunti, who hath Janardana for his protector, is incapable of being vanquished by gods, asuras, gandharvas, yakshas and rakshasas! Devoted to Brahma, truthful in speech, self-restrained, and compassionate towards all creatures, that son of Pritha, called Dhananjaya, never slaughters one that is asleep, or one that is heedless, or one that has laid aside his weapons or one that has joined his hands in supplication, or one that is retreating, or one whose locks have been dishevelled. Alas, they are rakshasas of wicked deeds who are perpetrating such terrible act upon us." Uttering such words, many laid themselves down. The loud din caused by the cries and groans of human beings died away within a short space of time. The earth being drenched with blood, O king, that thick and frightful dust soon disappeared. Thousands of men moving in agony, overwhelmed with anxiety and overcome with despair, were slain by Ashvatthama like Rudra slaying living creatures. Many who laid themselves down on the ground clasping one another, and many who sought to fly away, and many who sought to hide themselves, and many who struggled in battle, were all slain by the son of Drona. Burnt by the raging flames and slaughtered by Ashvatthama, the men, losing their senses, slew one another. Before half the night was over, the son of Drona, O monarch, despatched the large host of the Pandavas unto Yama's abode. That night, so terrible and destructive unto human beings and elephants and steeds filled with joy all creatures that wander in the dark. Many rakshasas and pishacas of various tribes were seen there, gorging upon human flesh and quaffing the blood that lay on the ground. They were fierce, tawny in hue, terrible, of adamantine teeth, and dyed with blood. With matted locks on their heads, their thighs were long and massive; endued with five feet, their stomachs were large. Their fingers were set backwards. Of harsh temper and ugly features, their voice was loud and terrible. They had rows of tinkling bells tied to their bodies. Possessed of blue throats, they looked very frightful. Exceedingly cruel and incapable of being looked at without fear, and without abhorrence for anything, they came there with their children and wives. Indeed, diverse were the forms seen there of the rakshasas that came. Quaffing the blood that ran in streams, they became filled with joy and began to dance in separate bands. "This is excellent!" "This is pure!" "This is very sweet!" these were the words they uttered. Other carnivorous creatures, subsisting upon animal food, having gorged upon fat and marrow and bones and blood, began to eat the delicate parts of corpses. Others, drinking the fat that flowed in streams, ran naked over the field. Possessed of diverse kinds of faces, other carnivorous beings of great ferocity, and living upon dead flesh, came there in tens of thousands and millions. Grim and gigantic rakshasas also, of wicked deeds, came there in bands as numerous. Other ghostly beings, filled with joy and gorged to satiety, O king, also came there and were seen in the midst of that dreadful carnage. When morning dawned, Ashvatthama desired to leave the camp. He was then bathed in human blood and the hilt of his sword so firmly adhered in his grasp that his hand and sword, O king, became one! Having walked in that path that is never trod (by good warriors), Ashvatthama, after that slaughter, looked like the blazing fire at the end of the yuga after it has consumed all creatures into ashes. Having perpetrated that feat agreeably to his vow, and having trod in that untrodden way, Drona's son, O lord, forgot his grief for the slaughter of his sire. The Pandava camp, in consequence of the sleep in which all within it were buried, was perfectly still when Drona's son had entered it in the night. After the nocturnal slaughter, when all became once more quiet, Ashvatthama issued from it. Having issued from the camp, the valiant Ashvatthama met his two companions and, filled with joy, told them of his feat, gladdening them, O king, by the intelligence. Those two, in return, devoted as they were to his good, gave him the agreeable intelligence of how they also had slaughtered thousands of Pancalas and Srinjayas (at the gates). Even thus did that night prove terribly destructive to the Somakas who had been heedless and buried in sleep. The course of time, without doubt, is irresistible. Those who had exterminated us were themselves exterminated now." 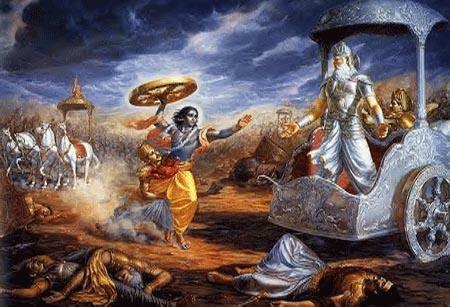 Dhritarashtra said, "Why is it that that mighty car-warrior, the son of Drona, did not achieve such a feat before although he had resolutely exerted himself for bestowing victory upon Duryodhana? For what reason did that great bowman do this after the slaughter of the wretched Duryodhana? It behoveth thee to tell me this!" Sanjaya said, "Through fear of the Parthas, O son of Kuru's race, Ashvatthama could not achieve such a feat then. It was owing to the absence of the Parthas and the intelligent Keshava as also of Satyaki, that Drona's son could accomplish it. Who is there, the lord Indra unexcepted, that is competent to slay them in the presence of these heroes? Besides, O king, Ashvatthama succeeded in accomplishing the feat only because the men were all asleep. Having caused that vast slaughter of the Pandava forces, those three great car-warriors (Ashvatthama, Kripa and Kritavarma), meeting together, exclaimed, "Good luck!" His two companions congratulated Ashvatthama, and the latter was also embraced by them. In great joy the latter uttered these words: "All the Pancalas have been slain, as also all the sons of Draupadi! All the Somakas also, as well as all that remained of the Matsyas, have been slaughtered by me! Crowned with success, let us without delay go there where the king is! If the king be still alive, we will give him this joyful intelligence!" Sanjaya said, "Having slain all the Pancalas and the sons of Draupadi, the three Kuru heroes together came to that spot where Duryodhana lay, struck down by the foe. Arrived there, they beheld that life had not been wholly extinct in the king. Jumping down from their cars, they surrounded thy son. The Kuru king, O monarch, was lying there with broken thighs. Almost senseless, his life was about to ebb away. He was vomiting blood at intervals, with downcast eyes. He was then surrounded by a large number of carnivorous animals of terrible forms, and by wolves and hyenas, that awaited at no great distance for feeding upon his body. With great difficulty the king was keeping off those beasts of prey that stood in expectation of feasting upon him. He was writhing on the earth in great agony. Beholding him thus lying on the earth, bathed in his own blood, the three heroes who were the sole survivors of his army, Ashvatthama and Kripa and Kritavarma, became afflicted with grief and sat surrounding him. Encompassed by those three mighty car-warriors who were covered with blood and who breathed hot sighs, the Kuru king looked like a sacrificial altar surrounded by three fires. Beholding the king lying in that highly undeserving plight, the three heroes wept in unendurable sorrow. Wiping the blood from off his face with their hands, they uttered these piteous lamentations in the hearing of the king lying on the field of battle. Kripa said, "There is nothing too difficult for destiny to bring about, since even this king Duryodhana who was the lord of eleven akshauhinis of troops sleepeth on the bare ground, struck down by the foes and covered with blood! Behold, fond he was of the mace, and that mace decked with pure gold still lieth by the side of the king whose splendour still resembles that of pure gold! In no battle did that mace abandon this hero! Even now, when he is about to ascend to heaven, that weapon leaveth not this illustrious warrior. Behold, that weapon, adorned with pure gold, still lieth by the side of this hero like a loving wife by the side of her lord stretched on his bed in his chamber of sleep. Behold the reverses brought about by Time! This scorcher of foes that used to walk at the head of all crowned kings, now eateth the dust struck down (by the foe)! He who had formerly struck down many foes and caused them to lie on the bare ground, alas, that king of the Kurus lieth today on the bare ground, struck down by foes. He to whom hundreds of kings used to bow down in fear, lieth today on the field of battle, surrounded by beasts of prey. The brahmanas formerly used to wait upon this lord for wealth. Alas, beasts of prey wait upon him today for feeding upon his body!" Sanjaya continued, "Beholding that chief of Kuru's race lying on the ground, Ashvatthama, O best of the Bharatas, uttered these piteous lamentations: "O tiger among kings, all people indicated thee as the foremost of all bowmen! People also said that (in encounters with the mace) thou, a disciple of Sankarshana, wert like the Lord of treasures (Kuvera), himself! How then, O sinless one, could Bhima notice any lapses in thee! Thou wert ever mighty and possessed of skill! He, on the other hand, O king, is a wicked-souled wight! Without doubt, O monarch, Time in this world is mightier than everything else, for we behold even thee struck down by Bhimasena in battle! Alas, how could the wretched and mean Vrikodara unrighteously strike thee down, thee that wert conversant with every rule of righteousness! Without doubt, Time is irresistible. Alas, having summoned thee to a fair fight, Bhimasena, putting forth his might, fractured thy thighs. Fie on that wretched Yudhishthira who tolerated the head of one unrighteously struck down in battle to be touched with the foot! In all battles warriors will certainly reprove Vrikodara as long as the world will last. Without doubt, thou hast been struck down unrighteously! The valiant Rama of Yadu's race, O king, always used to say that there is no one equal to Duryodhana in encounters with the mace. He of the Vrishni race, O Bharata, used to boast of thee, O lord, in every assembly, saying, ‘Duryodhana of Kurus race is a worthy disciple of mine!' Thou hast obtained that end which great rishis have declared to be the high reward of a kshatriya slain in battle with his face towards the foe. I do not, O bull among men, grieve for thee, O Duryodhana! I grieve only for thy mother Gandhari and thy sire, childless as they now are. Afflicted with sorrow, they will have to wander over the earth, begging their food. Fie on Krishna, Vrishni's race, and on Arjuna of wicked understanding! They regard themselves conversant with the duties of morality, yet both of them stood indifferent whilst thou wert being slain! How will the other Pandavas, shameless though they are, O king, speak of the manner in which they have accomplished thy death? Thou art highly fortunate, O son of Gandhari, since thou hast been slain on the field of battle, O bull among men, while advancing fairly against the foe. Alas, what will be the plight of Gandhari who is now childless, and who hath lost all her kinsmen and relatives! What also will be the plight of the blind king! Fie on Kritavarma, on myself, as also on mighty car-warrior Kripa, since we have not yet gone to heaven with thy royal self before us! Fie on us, lowest of mortals, since we do not follow thee that wert the granter of all wishes, the protector of all men, and the benefactor of all thy subjects! Through thy power, the abodes of Kripa, of myself, and of my sire, along with those of our dependants, O tiger among men, are full of wealth. Through thy grace, ourselves with our friends and relatives have performed many foremost of sacrifices with a profusion of presents to brahmanas. Where shall such sinful persons as ourselves now go, since thou hast gone to heaven, taking with thee all the kings of the earth? Since we three, O king, do not follow thee that art about to obtain the highest end (of life), it is for this that we are indulging in such lamentations. Deprived of thy companionship, reft of wealth, our memories painfully dwelling upon thy prosperity, alas, what will be our lot since we do not go with thee? Without doubt, O chief of Kuru's race, we shall have to wander in grief on the earth. Deprived of thee, O king, where can we have peace and where can we have happiness? Having said these words the high-souled king of the Kurus became silent. Casting off his griefs for all his (slain) kinsmen, he then gave up his life-breath. His soul ascended to sacred heaven, while his body only remained on earth. Even thus, O king, thy son Duryodhana breathed his last. Having provoked the battle first, he was slain by his foes at last. The three heroes repeatedly embraced the king and gazed steadfastly on him. They then ascended their cars. Having heard these piteous lamentations of Drona's son, I came away at early dawn towards the city. Even thus the armies of the Kurus and Pandavas have been destroyed. Great and terrible have been that carnage, O king, caused by thy evil policy. After thy son had ascended to heaven, I became afflicted with grief and the spiritual sight which the rishi gave hath been lost by me!" Vaishampayana continued, "The king, hearing of his son's death, breathed long and hot sighs, and became plunged in great anxiety." Vaishampayana said, "After that night had gone away, the driver of Dhrishtadyumna's car gave intelligence to king Yudhishthira of the great slaughter that had been caused during the hour of sleep. The driver said, "The sons of Draupadi, O king, have been slain, with all the children of Drupada himself, while they were heedless and trustfully asleep in their own camp! During the night, O king, thy camp has been exterminated by the cruel Kritavarma, and Kripa, the son of Gautama, and the sinful Ashvatthama! Slaying thousands of men and elephants and steeds with lances and darts and battle-axes, those men have exterminated thy army. While thy army was being slaughtered like a forest cut down with axes, a loud wail was heard rising from thy camp. I am the sole survivor, O monarch, of that vast force. I have, O thou of virtuous soul, escaped with difficulty from Kritavarma at a time when he was heedless!" Hearing these evil tidings, Kunti's son Yudhishthira, however, capable of bearing up (against foes), fell down on the earth, afflicted with grief at the loss of his sons. Advancing forward, Satyaki held the king in his embrace. Bhimasena and Arjuna and the two sons of Madri also stretched forth their arms. Having recovered his senses, the son of Kunti lamented in great affliction, uttering these words rendered indistinct by sorrow: "Alas, having vanquished the foe, we have ourselves been vanquished in the end! The course of events is difficult to be ascertained even by persons endued with spiritual sight. The foes, who were vanquished have become victorious! Ourselves, again, while victorious, are vanquished! Having slain brothers and friends and sires and sons and well-wishers, and kinsmen, and counsellors, and having vanquished them all, we ourselves are vanquished at last! Misery looks like prosperity and prosperity looks like misery! This our victory has assumed the shape of defeat. Our victory, therefore, has ended in defeat! Having won the victory, I am obliged to grieve as an afflicted wretch. How, then, can I regard it as a victory? In reality, I have been doubly defeated by the foe. They for whose sake we have incurred the sin of victory by slaying our kinsmen and friends, alas, they, after victory had crowned them, have been vanquished by defeated foes that were heedful! Alas, through heedlessness have they been slain that had escaped from even Karna, that warrior who had barbed arrows and nalikas for his teeth, the sword for his tongue, the bow for his gaping mouth, and the twang of the bowstring and the sound of palms for his roars--that angry Karna who never retreated from battle, and who was a very lion among men! Alas, those princes that succeeded in crossing, by boats constituted by their own excellent weapons, the great Drona-ocean having cars for its deep lakes, showers of arrows for its waves, the ornaments of warriors for its gems, car-steeds for its animals, darts and swords for its fishes, elephants for its alligators, bows for its whirlpools, mighty weapons for its foam, and the signal of battle for its moonrise causing it to swell with energy, and the twang of the bowstring and the sound of palms for its roar,--alas, even those princes have from heedlessness been slain! There is, in this world, no more powerful cause of death, as regards men, than heedlessness! Prosperity abandons a heedless man from every side, and every kind of misery overtakes him. The tall standard with excellent top that stood on his car was the wreath of smoke that infallibly indicated the Bhishma-fire. Shafts constituted its flames, and wrath was the wind that fanned it! The twang of his formidable bow and the sound of his palms constituted the roar of that fire. Armour and diverse kinds of weapons were the homa libations that were poured into it. The vast hostile army was the heap of dry forest-grass that was assailed by that fire. Alas, even they that had endured that fierce fire whose terrible energy was represented by the mighty weapons in Bhishma's hand have at last fallen through heedlessness. A heedless person can never acquire knowledge, asceticism, prosperity, or great renown. Behold, Indra has obtained great happiness after slaying all his foes heedfully. Behold the survivors among our foes have, through our heedlessness, slain so many sons and grandsons of kings, each of whom was really like Indra himself. Alas, they have perished like merchants with rich freight perishing through carelessness in a shallow stream after having crossed the great ocean. They whose bodies are now lying on the bare ground, slain by those vindictive wretches, have without doubt ascended to heaven. Having in deep affliction indulged in these lamentations, that king of Kuru's race then addressed Nakula, saying, ‘Go and bring the unfortunate princess Draupadi here along with all her maternal relations.' Obediently accepting that command of the king who equalled Yama himself in righteousness, Nakula speedily proceeded on his car to the quarters of Draupadi where that princess resided with all the wives of the Pancala king. Having despatched the son of Madri, Yudhishthira, crushed by grief, proceeded with tears in his eyes accompanied by those friends of his, to the field on which his sons had battled and which still teemed with diverse kinds of creatures. Having entered that cursed field abounding with fierce sights, the king saw his sons, well-wishers, and friends, all lying on the ground, covered with blood, their bodies mangled, and heads separated from their trunks. Beholding them in that plight, Yudhishthira, that foremost of righteous men, became deeply afflicted. That chief of the Kurus then began to weep aloud and fell down on the earth, deprived of his senses, along with all his followers." Vaishampayana said, "Beholding his sons, grandsons, and friends all slain in battle, the king's soul became overwhelmed with great grief, O Janamejaya! Recollecting those sons and grandsons and brothers and allies, a deep sorrow took possession of the illustrious monarch. Senseless and trembling, his eyes were bathed in tears. His friends then, themselves filled with anxiety, began to comfort him. At that time, Nakula, skilled in executing errands, arrived there on his car of solar effulgence, accompanied by the princess Krishna in great affliction. She had been residing at Upaplavya. Having received that heartrending intelligence about the slaughter of all her sons, she became exceedingly agitated. Trembling like a plantain tree shaken by the wind, the princess Krishna, arrived at the presence of Yudhishthira, fell down, afflicted by grief. Her face, adorned with eyes resembling a couple of full-blown lotuses, seemed to be darkened by grief like the Sun himself when enveloped in darkness. Beholding her prostrate on the earth, the wrathful Vrikodara, of prowess incapable of being baffled, advancing hastily, raised her up and clasped her with his arms. The beautiful lady, comforted by Bhimasena, began to weep, and addressing the eldest son of Pandu with his brothers, said, "By good luck, O monarch, having obtained the whole earth, thou shalt enjoy her after the slaughter of thy brave sons in the observance of kshatriya duties. By good luck, O son of Pritha, thou art happy at the thought of having obtained the whole earth. By good luck, thy thoughts do not dwell on Subhadra's son whose tread resembled that of an infuriated elephant. By good luck, thou dost not, like myself while residing at Upaplavya, recollect thy heroic sons slaughtered in the observance of kshatriya duties. O son of Pritha, hearing of the slaughter of those sleeping heroes by Drona's son of sinful deeds, grief burns me as if I were in the midst of a fire. If Drona's son be not made to reap the fruit of that sinful deed of his, if, putting forth your prowess in battle, thou dost not take the life of that wretch of sinful deeds, along with the lives of all his followers, then listen to me, ye Pandavas, I shall sit here in praya!" Having said these words, the helpless Krishna, the daughter of Yajnasena, sat by the side of the eldest son of Pandu, king Yudhishthira the just. The royal sage, Yudhishthira, of righteous soul, seeing his dear queen sit in praya, addressed her, saying, "O auspicious lady, O thou that art conversant with morality, all thy sons and brothers have righteously met with a noble death. It behoveth thee not to grieve for them. As regards Drona's son, he hath gone to a distant forest, O beautiful princess! How shall thou O lady, make thyself sure of his fall in battle?" Draupadi answered, "I have heard that Drona's son hath a gem on his head, born with him. I shall see that gem brought to me after the slaughter of that wretch in battle, Placing that gem on thy head, O king, I shall endure to live. Even this is my resolve." Having said these words unto the royal son of Pandu, the beautiful Krishna approached Bhimasena and said these words of high purpose unto him: "Remembering the duties of a kshatriya, O Bhima, it behoveth thee to come to my rescue. Slay that man of sinful deeds like Maghavat slaying Samvara. There is no one in this world who is equal to thee in prowess. It is known throughout the world how on an occasion of great calamity thou becamest at the town Varanavata the refuge of all the Parthas. When again we were seen by Hidimba, it was thou that becamest our refuge in the same way. Like Maghavat rescuing (his spouse) the daughter of Puloma, thou didst rescue my afflicted self, in Virata's city, from a great calamity. Like those great feats, O Partha, that thou didst achieve in former days, slay now, O slayer of foes, the son of Drona and be thou happy!" Hearing these and other piteous lamentations of the princess, Kunti's son, Bhimasena, of great might, could not endure them. He mounted upon his great car adorned with gold and took his beautiful bow with arrow placed on the string. Making Nakula his charioteer, and resolved upon slaying the son of Drona, he began to stretch his bow and caused his steeds to be urged without delay. Those steeds, fleet as the wind, thus urged, O tiger among men, proceeded with great speed. Possessed of great valour and unfading energy, Bhima set out from the Pandava camp and proceeded with great celerity along the track of Ashvatthama's vehicle." Vaishampayana said, "After the irresistible Bhimasena had set out, that bull of Yadu's race, possessed of eyes like lotus-petals, addressed Kuru's son Yudhishthira, saying, ‘O son of Pandu, this brother of thine, overwhelmed with grief at the slaughter of his sons, proceedeth alone to battle, from desire of slaying the son of Drona. O bull of Bharata's race, of all thy brothers, Bhima is thy dearest! Beholding him fallen into a great danger why dost thou not stir thyself? The weapon called brahmashira, which that subjugator of hostile towns, Drona, communicated to his son, is capable of consuming the whole world. The illustrious and highly blessed preceptor, that foremost of all wielders of bows, delighted with Dhananjaya, had given him that very weapon. Unable to endure it, his only son then begged it of him. Unwillingly he imparted the knowledge of that weapon to Ashvatthama. The illustrious Drona knew the restlessness of his son. Acquainted with all duties, the preceptor laid this command on him, saying, "Even when overtaken by the greatest danger, O child in the midst of battle, thou shouldst never use this weapon, particularly against human beings." Even thus the preceptor Drona spoke unto his son. A little while after he again spoke, saying, "O bull among men, thou wilt not, it seems, walk in the path of the righteous." Hearing those bitter words of his sire, the wicked-souled Ashvatthama, in despair of obtaining every kind of prosperity, began in grief to wander over the earth. Vaishampayana said, "Having said these words, that foremost of all wielders of weapons, that delighter of all the Yadavas, mounted upon his excellent car equipped with every kind of powerful weapons. Unto that vehicle were yoked two pairs of foremost steeds of the Kamboja breed, that were adorned with garlands of gold. The dhur of that best of cars was of the hue of the morning sun. On the right was yoked the steed known as Shaibya; on the left was placed Sugriva; the Parshni was borne by two others called Meghapushpa and Balahaka. There was seen on that car a celestial standard decked with gems and gold and created by the divine Artificer, and standing high like the Maya (of Vishnu himself). Upon that standard was Vinata's son (Garuda) shining with great splendour. Indeed, that enemy of snakes perched on the standard-top of Keshava who is Truth embodied. Then Hrishikesha, that foremost of all bowmen, mounted on that car. After him Arjuna of irresistible feats and Yudhishthira, the king of the Kurus, ascended the same vehicle. Seated on that car, by the side of him of Dasharha's race who wielded the bow called sharnga, the two sons of Pandu looked exceedingly beautiful, like the twin Ashvinis seated by the side of Vasava. Causing them to ascend on that car of his which was adored by all the world, he of Dasharha's race urged those foremost of steeds endued with great fleetness. Those steeds then suddenly flew, taking after them that excellent vehicle ridden by the two sons of Pandu and by that bull of Yadu's race. Endued with great speed, as those animals bore away the wielder of sharnga, loud became the noise caused by their rush, like that of birds coursing through the air. Drona's son, beholding that terrible bowman coming towards him bow in hand, and the two brothers on Janardana's car, became exceedingly agitated and thought his hour had come. Of soul incapable of being depressed, he called to his mind that high weapon (which he had obtained from his sire). He then took up a blade of grass with his left hand. Fallen into great distress, he inspired that blade of grass with proper mantras and converted it into that powerful celestial weapon. Unable to brook the arrows (of the Pandavas) and the presence of those wielders of celestial weapons, he uttered in wrath these terrible words: ‘For the destruction of the Pandavas.' Having said these words, O tiger among kings, the valiant son of Drona let off that weapon for stupefying all the worlds. A fire then was born in that blade of grass, which seemed capable of consuming the three worlds like the all-destroying Yama at the end of the yuga." That weapon, quickly let off by the wielder of gandiva, blazed up with fierce flames like the all-destroying fire that appears at the end of the yuga. Similarly, the weapon that had been shot by Drona's son of fierce energy blazed up with terrible flames within a huge sphere of fire. Numerous peals of thunder were heard; thousands of meteors fell; and all living creatures became inspired with great dread. The entire welkin seemed to be filled with noise and assumed a terrible aspect with those flames of fire. The whole earth with her mountains and waters and trees, trembled. Then the two great rishis, Narada, who is the soul of every creature, and the grandsire of all the Bharata princes (Vyasa), beholding those two weapons scorching the three worlds, showed themselves there. The two rishis sought to pacify the two heroes Ashvatthama and Dhananjaya. Conversant with all duties and desirous of the welfare of all creatures, the two sages, possessed of great energy, stood in the midst of those two blazing weapons. Incapable of being overwhelmed by any force, those two illustrious rishis, placing themselves between the two weapons, stood like two blazing fires. Incapable of being checked by any creature endued with life, and adorned by the gods and danavas, they two acted in this way, neutralising the energy of the two weapons and doing good to all the world. The two rishis said, "Those great car-warriors who have fallen in this battle were acquainted with diverse kinds of weapons. They, however, never shot such a weapon upon human beings. What act of rashness is this, ye heroes, that ye have done?" Having said these words Dhananjaya withdrew his weapon. The withdrawal of that weapon by the gods themselves in battle is exceedingly difficult. Not excepting the great Indra himself, there was nobody save the son of Pandu, who was capable of withdrawing that high weapon after it had once been let off. That weapon was born of Brahma energy. No person of uncleansed soul can bring it back after it is once let off. Only one that leads the life of a brahmacari can do it. If one who has not practised the vow of brahmacarya seeks to bring it back after having shot it, it strikes off his own head and destroys him with all his equipments. Arjuna was a brahmacari and an observer of vows. Having obtained that almost unobtainable weapon, he had never used it even when plunged into situations of the greatest danger. Observant of the vow of truth, possessed of great heroism, leading the life of a brahmacari, the son of Pandu was submissive and obedient to all his superiors. It was for this that he succeeded in withdrawing his weapon. Vyasa said, "Pritha's son Dhananjaya, O child, was acquainted with the weapon called brahmashira. Neither from wrath, nor for thy destruction in battle, did he shoot this weapon. Arjuna, on the other hand, used it for baffling thy weapon. He has again withdrawn it. Having obtained even the brahmastra through thy sire's instructions, the mighty-armed Dhananjaya did not fall off from a kshatriya's duties. Arjuna is possessed of such patience, and such honesty. He is, besides, conversant with every weapon, Why dost thou seek to compass the destruction of such a person with all his brothers? That region where the weapon called brahmashira is baffled by another high weapon suffers a drought for twelve years, for the clouds do not pour a drop of water there for this period. For this reason, the mighty-armed son of Pandu, although he had the power, would not, from desire of doing good to living creatures, baffle thy weapon with his. The Pandavas should be protected; thy own self should be protected; the kingdom also should be protected. Therefore, O thou of mighty arms, withdraw this celestial weapon of thine. Dispel this wrath from thy heart and let the Pandavas be safe. The royal sage Yudhishthira never desires to win victory by perpetrating any sinful act. Give unto these that gem which is on thy head. Taking that, the Pandavas will in return grant thee thy life!" Drona's son said, "This my gem is more valuable than all the wealth that has ever been earned by the Pandavas and the Kauravas. If this gem is worn, the wearer ceases to have any fear from weapons or disease or hunger! He ceases to have any fear of gods and danavas and nagas! His apprehensions from rakshasas as also from robbers will cease. Even these are the virtues of this gem of mine. I cannot, by any means, part with it. That, however, O holy one, which thou sayest, should be done by me. Here is this gem. Here is myself. This blade of grass (inspired into a fatal weapon) will, however, fall into the wombs of the Pandava women, for this weapon is high and mighty, and incapable of being frustrated. O regenerate one, I am unable to withdraw it, having once let it off. I will now throw this weapon into the wombs of the Pandava women. As regards thy commands in other respects, O holy one, I shall certainly obey them." Vyasa said, "Do then this. Do not, however, entertain any other purpose, O sinless one! Throwing this weapon into the wombs of the Pandava women, stop thyself." Vaishampayana continued, "The son of Drona, having heard these words of the island-born, threw that uplifted weapon into the wombs of the Pandava women." The holy one said, "The fall of this mighty weapon will not be fruitless. The foetus will die. But being dead, it will live again and have a long life! As regards thyself, all wise men know thee for a coward and a sinful wretch! Always engaged in sinful acts, thou art the slayer of children. For this reason, thou must have to bear the fruit of these thy sins. For 3,000 years thou shalt wander over this earth, without a companion and without being able to talk with anyone. Alone and without anybody by thy side, thou shalt wander through diverse countries, O wretch, thou shalt have no place in the midst of men. The stench of pus and blood shall emanate from thee, and inaccessible forests and dreary moors shall be thy abode! Thou shalt wander over the Earth, O thou of sinful soul, with the weight of all diseases on thee. The heroic Parikshit, attaining to age and a knowledge of the Vedas and the practice of pious vows, shall obtain all weapons from the son of Sharadvata. Having obtained a knowledge of all high weapons, and observant of all kshatriya duties, that righteous-souled king shall rule the earth for sixty years. More than this, that boy shall become the mighty-armed king of the Kurus, known by the name of Parikshit, before thy very eyes, O thou of wicked soul! Though burnt by the energy of thy weapon's fire, I shall revive him. O lowest of men, behold the energy of my austerities and my truth." Vyasa said, "Since, disregarding us, thou hast perpetrated this exceedingly cruel act, and since thy behaviour is such although thou art a good brahmana (by birth), therefore, those excellent words that Devaki's son has said, will, without doubt, be realised in thy case, an adopter as thou hast been of kshatriya usages!" Ashvatthama said, "With thyself among all men, O holy one, I shall live! Let the words of this illustrious and foremost of men become true!" Vaishampayana continued, "Drona's son, then, having made over his gem to the high-souled Pandavas, cheerlessly proceeded, before their eyes, to the forest. The Pandavas who had killed and chastised all their foes, placed Govinda and the island-born Krishna and the great ascetic Narada at their head, and taking the gem that was born with Ashvatthama, quickly came back to the intelligent Draupadi who was sitting in observance of the praya vow. Those tigers among men, borne by their excellent steeds resembling the wing in fleetness, came back with him of Dasharha's race to their encampment. 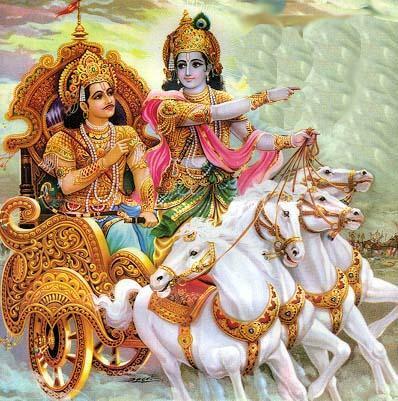 Speedily alighting from their cars, those great car-warriors, themselves much more afflicted, beheld, Drupada's daughter Krishna afflicted with woe. Approaching the cheerless princess stricken with sorrow and grief, the Pandavas with Keshava, sat round her. Then the mighty Bhimasena, desired by the king, gave that celestial gem unto her and said these words: "This gem, O amiable lady, is thine. The slayer of thy sons hath been vanquished. Rise, casting off thy sorrow, and recollect the duties of a kshatriya lady. O thou of black eyes, when Vasudeva was about to set out (from Upaplavya) on his mission of peace, thou hadst, O timid lady, said even these words unto the slayer of Madhu, "I have no husbands! I have no sons, nor brothers! Nor art thou alive, O Govinda, since the king desires for peace!" Those bitter words were addressed by thee to Krishna, that foremost of persons! It behoveth thee to recollect those words of thine that were so consistent with kshatriya usages. The wretched Duryodhana, that obstacle on the way of our sovereignty, has been slain. I have quaffed the blood of the living Duhshasana. We have paid off the debt we owed to our enemy. People, while talking, will not be able to censure us any longer. Having vanquished Drona's son, we have set him free for the sake of his being a brahmana and of the respect that should be shown to our deceased preceptor. His fame hath been destroyed, O goddess, only his body remains! He has been divested of his gem and on earth he has been reft of his weapons!" Draupadi said, "I desired to only pay off our debt for the injury we have sustained. The preceptor's son is worthy of my reverence as the preceptor himself. Let the king bind this gem on his head, O Bharata!" The king then, taking that gem, placed it on his head, at the desire of Draupadi and regarding it as a gift from the preceptor. Holding on his head that excellent and celestial gem, the puissant king looked beautiful like a mountain with the moon above it. Though stricken with grief on account of the death of her sons, the princess Draupadi, possessed of great mental strength, gave up her vow. Then king Yudhishthira enquired of the mighty-armed Krishna, saying the following words." The holy one said, "Verily, Drona's son had sought the aid of that highest of all the gods, the eternal Mahadeva. It was for this that he succeeded in slaying, single-handed, so large a number of warriors. If Mahadeva be gratified, he can bestow even immortality. Girisha can give such valour as will succeed in checking Indra himself. I know Mahadeva truly, O bull of Bharata's race! I know also his various acts of old. He, O Bharata, is the beginning, the middle, and the end of all creatures. This entire universe acts and moves through his energy. The puissant Grandsire, desirous of creating living creatures, saw Rudra; and the Grandsire asked him, saying, "Create living creatures without delay!" Thus asked, Rudra of tawny locks, saying, "So be it!" plunged into the water and practised austerities for a long time, inasmuch as he was sensible of the defects of living creatures. Having waited in expectation of Rudra for a very long time, the Grandsire, by a fiat of his will, invoked into existence another being for making him the creator of all kinds of living things. Beholding Girisha plunged into the waters, this (second) being said unto his sire, "If there be no being born before me, then I will create living creatures!" His sire replied unto him, saying, "There is no other first-born being besides thee! This Sthanu has plunged into the water! Go and create living creatures, without any anxiety!" That being then created many living creatures, having Daksha for their first, who created all these creatures of four kinds. As soon, however, as they were created, they ran O king, towards their sire, afflicted with hunger and desirous of devouring him. The second being whom Brahma had created, thereupon ran towards him, desirous of protection from his own offspring. And he said unto the Grandsire, "O illustrious one, protect me from these, and let these creatures have their food assigned unto them!" Then the Grandsire assigned herbs and plants and other vegetables as their food, and unto those that were strong he assigned the weaker creatures as the means of sustenance. Their sustenance having been thus assigned, the newly-created creatures all went away to regions they desired, and cheerfully multiplied by union with their respective species. After the creatures had multiplied and the Grandsire had become well pleased, the first-born rose from the water and beheld the living creation. He saw that diverse kinds of creatures had been created and that they had multiplied by their own energy. At this sight, Rudra became angry and caused his procreative limb to disappear in the bowels of the Earth. The unfading Brahma, soothing him by soft words, said unto him, "O Sharva, what wert thou doing so long within the water? For what reason, also hast thou caused thy limb of generation to disappear in the bowels of the Earth?" Thus questioned, that lord of the universe wrathfully answered the lord Brahman, "Somebody else has created all these creatures! What purpose then would be served by this limb of mine? I have by my austerities, O Grandsire, created food for all these creatures. These herbs and plants also will multiply like those that will subsist upon them!" Having said these words, Bhava went away, in cheerlessness and rage, to the foot of the Menjavat mountains for practising severer austerities."